Why most people went to Charlestown during the seventeenth century we can only guess. Individuals were usually far too occupied during preparation, emigration, and plantation to record their reasons for undertaking this life-threatening ordeal. We can only adduce possible factors from the heart-searchings of such (hardly typical) emigrants as Governor Winthrop, and from the prevailing conditions in emigrant areas of England. Charlestown was settled by striving young Bristolians and Londoners driven to escape the frustrating economic conditions at home. Historians of early seventeenth-century London and Bristol emphasize the power of privileged corporate groups like the East India Company, the Levant Company, and the London and Bristol Merchant Adventurers over traditional links with the Iberian Peninsula, the Mediterranean, and the Far East. The enterprise of outsiders and newcomers was diverted to opening up fresh markets and commodities, especially in the North Atlantic and the Caribbean, not to mention interloping in forbidden areas and smuggling protected cargoes. Significantly, many of these commercial outsiders were residential outsiders as well, coming from two predominantly commercial and industrial overspills, Stepney and Southwark. Here the influence and control of the great London merchants was much reduced. Most Charlestown merchants and skippers had continuing old-country connections. Emigration involved them as New England contacts and agents for international family firms. For them relations with the old world were not ruptured, and many of them returned to England on brief business visits, or, after the defeat of the monarchy in the 1640s, on extended missions. Old England was a toxic carcass to abandon; New England, increasingly familiar, an unsullied opportunity to embrace. Charlestown offered the possibility of religious purity, a utopian fresh start. It also held out the prospect of free and ample land to the landless, to insecure tenants and stunted households. It was a West Atlantic base for the exploitation of rich natural resources by resident agents of family firms. Both a refuge and a springboard, the haven at the northern lip of the Charles River would weld together a remarkable and diverse collection of settlers into a biddable and cohesive town, at least for the first half of its existence. 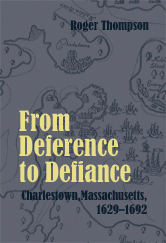 Adapted from Roger Thompson’s From Deference to Defiance. Roger, your book remains a revelation and an education for me, introducing me to ancestors and the context of their lives which I could never have imagined. I’m especially grateful for the information you discovered on Margaret Willoughby Hammond, my 10th great-grandmother, helping me paint her portrait in my forthcoming book about my family’s three centuries of complicity in African and Native American slavery. Thank you. I should probably know this but what is ICYMI? Initialism for “in case you missed it”. I am always happy to revisit older posts. Some I missed, some I am reading with new awareness. This is one, and I realize that this book has some insights I can put to good use. Migration interests me, both to America and within America. I think this book will become part of my library as I work to understand what motivated the diverse group of people I am descended from to leave the known and settle in New England. I wonder if, since this is an excerpt from Mr Thompson’s book, if the book itself might give you the information you are seeking? The paperback version in the NEHGS bookstore is quite reasonable (I just placed an order for my copy). Everything from NEHGS now seems to be an advertisement! Even Vita Brevis. It’s a shame. As I recall from school, Charleston had the second largest, if not the largest, settlement of Jews in America in its early history. How does this factor in with migrants you write about?